Kalibobo Spirit goes effortlessly where others cannot, deep into some of the most remote rivers, waterways and islands in the world… deep into the heart of Papua New Guinea. 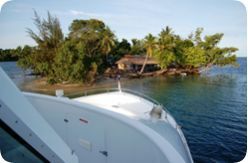 With a 7.49 metre beam, spanning 30 metres in length with a draft of 1.93 metres and four decks, Kalibobo Spirit is cleverly designed to balance privacy, comfort and space with the ability to operate in areas as diverse as the middle Sepik and the Trobirand Islands, under both Queensland and PNG Survey. 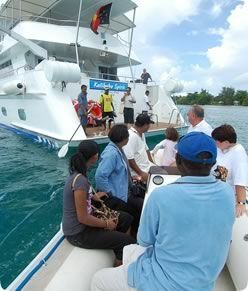 Traveling at the wish of our guests, taking as long as they want in each of the unique areas visited, shipboard life is relaxed, informal and sociable. There are no dress codes apart from consideration of your own comfort. Kalibobo Spirit is, in every respect, an intimate experience!